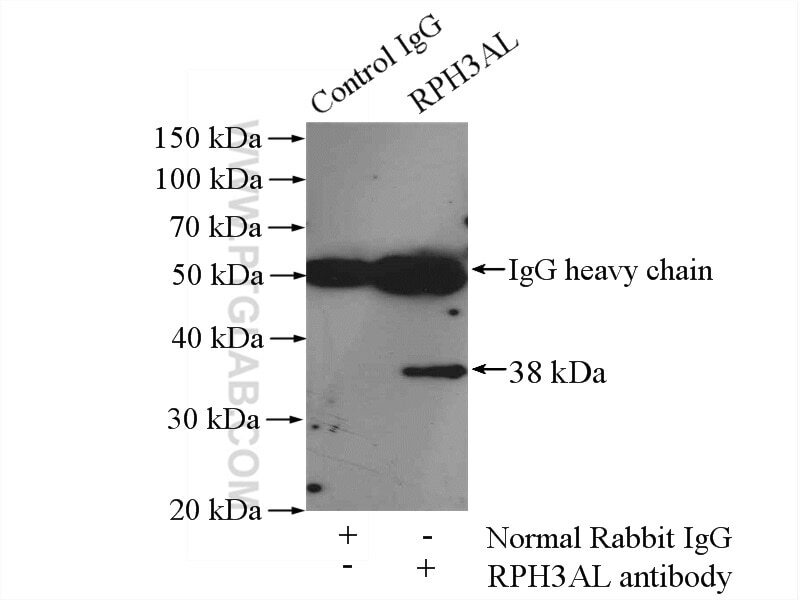 IP Result of anti-RPH3AL (IP:15297-1-AP, 4ug; Detection:15297-1-AP 1:500) with HepG2 cells lysate 2400ug. Rabphilin-3A-like (RPH3AL), also known as Noc2, is a Rab effector protein with a molecular weight of 38 kDa. It is expressed abundantly in endocrine cells but at low levels in exocrine tissues, playing a direct regulatory role in calcium-ion-dependent exocytosis in both endocrine and exocrine cells, and also having a key role in insulin secretion by pancreatic cells. RPH3AL functions as a potential RAB3B effector protein in epithelial cells, and RPH3AL gene is likely a tumor suppressor. Rab2a and Rab27a cooperatively regulate transition from granule maturation to exocytosis through the dual effector Noc2.